If the Runner has no cards in their stack but a Tech Trader installed, can the Runner use Sports Hopper? No. Sports Hopper's effect cannot change the game state, so its ability cannot be triggered. Wouldn't it be nice if Plascrete Carapace also worked against Net damage and gave you +1 while it was installed? Although the Sports Hopper only gives you 3 cards it is far more flexible than Plascrete and can even double as a emergency Diesel or as a reload for Faust. Plascrete is essentially a dead card if you are not facing Meat Damage. Sports Hopper will almost never be a dead card. In decks it can pair nicely with I've Had Worse to help survive double scorch. The only thing it can't do in terms of flatline prevention compared to Plascrete is stop a Shutdown Combo. You could trigger the ability immediately after the Shutdown but if you are facing a triple Scorch there's not much that could save you that is currently released and reasonable to play in ordinary decks. The other downside is that you will lose the cards in your hand to the first Scorch. Better have some recursion handy. There is enough written already about the mechanics of this card, but what I like most about it, and what amuses me every time I play it, is the flavour text. In case you wonder why: Read the flavour text of Advanced Concept Hopper first, then this. Well done, FFG, well done! At first glance, it seems clear that Sports Hopper is intended as a replacement for Plascrete Carapace, once rotation arrives (in 2017?) and Plascrete is no longer usable in tournament decks. But how does it compare? Should you make the switch now? The contrast between Plascrete and Hopper is significant, and shows a maturity of game design. While Plascrete is a silver bullet answer to Scorched Earth, Hopper is an elegant, multipurpose card. Considering the case vs Scorched, Plascrete is better protection, no question. Firstly, you don't even lose cards for the meat damage, and secondly by protecting against 4 points of damage, you have the flexibility to safely end your turn on 4 cards. Hopper won't stop the damage taking cards out your grip, and you also must be sure to end turns on 5 cards in order for a single installed copy to protect you. However it will still prevent a double-scorched from ending you, so it can do the job. But against other decks, it gets interesting. Plascrete is the deadest of draws - discard and move on. Let's consider playing against a net damage deck, Hopper vs probably the best current blunt answer Deus X. The contrast is strikingly similar to vs Plascrete for meat damage. It's less good as you still lose cards, and it offsets only 3 points of damage while Deus X is all damage from one source. (And often 'all' net damage will be more than 3 damage - but occasionally offsetting 3 damage is actually better, eg vs 3 Shock!s in Archives). Hopper is good vs AP ice as you can use it after rez but before subroutines fire, so it'll help against potentially game-ending nasties like Merlin(s), Cortex Lock, or Shinobi. There is also a window to trigger it after a Ronin is rezzed before his ability is used. You can also rez it before committing to access an advanced card you suspect may be a Fetal AI or Project Junebug, but you will have to do it before seeing these cards. Then, what about a Fast Advance or Glacier deck that you expect will not threaten any damage at all? Hopper still has some potential value - if you have credits to spare and want more draw (a fairly common scenario), you can spend a click and 3 credits to draw 3 cards. You won't be using it to replace Diesel, but it will sometimes be useful. There are two aspects to this card that I think are brilliant design. Firstly, as a more general defensive option that can replace Plascrete and Deus X at once but in a weaker form, it is better for the game - it gives runners a realistic option to protect themselves from two Corp deck archetypes in a single card, but its inclusion in a runner's deck doesn't completely shut down those Corp deck archetypes, making for more interesting games. Secondly, the inclusion of 1 link is a genius. By adding it to this card that will surely see widespread play for years to come, the link/trace aspect of the game has some added dynamism. No longer will runner's link equal their ID's base link in 95% of games, it will climb to 2 link on a regular basis. Overall, a great card for the game, and a good multi-purpose card for your deck to defend against multiple threats. Naturally, for 3 cost, it's not worth it alone for the link strength, but can be a nice filler for Sunny. And with the trash ability, it's not rocket science to be drawn to this with Geist. Thankfully, 0 influence cost. Tempted to put this in a Link Andy deck, using Sunny's console, rabbit hole, and spend a few turns laughing at NBN tracers giving me money via 3 X Power Taps. The issue with silver bullets has long been that they are dead draws agains most match ups. This has even led some players to cut Plascrete Carapace from their decks, as the protection against a rarely played deck is just not enough to warrant inclusion. Another issue is that silver bullets often only bullet one matchup at a time. Enter Sports Hopper. Coming in at a modest three cost and no influence, Sports Hopper looks underwhelming at first. After all, 3 creds and a click for a net of two cards seems pretty bad. And the link is no good if the hopper is in your discard pile. It could make some good filler in mini-faction decks, and in Geist, the efficiency can get pretty ridiculous really fast. But look again. The draw does not need a click to work. What does this mean? It means that you can trigger it in between scorches. "Okay, that's seeming a little better," you might be thinking, "but it is still worse than Plascrete!" No, it isn't. There are only three common decks that Plascrete can help with. Haarp Shop, and Argus/SeaScorch. In other words, it is good against tracer decks, net damage decks, scorch decks, in other words, anything that attacks the runner. Plus, it gives you a link while it is down on the table, whereas Plascrete just sits there. It doesn't work against Mushin Junebug, unless you use it before accessing, so keep that in mind. The final use is the clickless draw. At this time last year, nobody would care about this. Now we have Faust. Being able to get three extra cards for that run on a remote server is amazing, and any Faust player (in otherwords, any runner) should include 3 of these. So while Sports Hopper doesn't really do anything too well, it has lots more versatility than Plascrete, so you should make the switch now. The effect is iffy. If you need at least 1 to kick-start Underworld Contact or Cloud Icebreakers, you're much better off with the permanent Dyson Mem Chip (! ), the cheaper Forger (tag avoidance! ), or the stronger Rabbit Hole (+3!). I guess it might be okay with Inside Man, but I haven't seen a hardware-heavy deck before. ...I'll get back to you on that. Anyway, the ability is where it's at. Put these in a Hayley or Geist with Tech Trader support, and suddenly this card is pretty good. Instead of a slightly weaker Plascrete Carapace with serious dead draw issues, it now moonlights as a zero- Diesel for Hayley and nearly a free Quality Time for Geist! 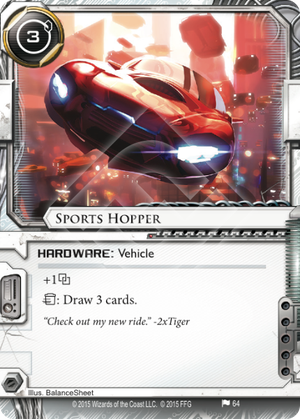 It's no Sure Gamble, but Sports Hopper has a great support role in decks built around -effects.